Peterson Manufacturing introduces a 7-inch LED headlight with Osram Ostar Headlamp Pro for 12 and 24 volt vehicles. Peterson Manufacturing has found the perfect mate for its new 7-inch headlight in the Osram Ostar Headlamp Pro LED from Osram Opto Semiconductors. This LED light is the best choice for the headlight due to its excellent features such as providing a compact light source with multichip on board technology and silicon casting featuring ceramic chip level conversion (C^2) and latest chip technology (UX:3). The LED headlight displays great brightness and luminance due to pure surface emission and low thermal resistance (Rth) for thermal stability, as well as improved corrosion resistance. The Osram Ostar Headlamp Pro is a high-end, high-power LED light source. As an important milestone in LED-performance, it easily achieves the same output as a halogen lamp. This compact multichip LED produces so much light from such a small footprint (20 mm x 20 mm) that it is even a great solution for high-beam applications. The LED is available in 2, 3, 4 and 5 chip versions. With lighting efficacy of 40*106 cd/m2 and a spreading surface of 5.5 mm, the 5 chip version is an ideal LED solution for automotive exterior lighting. Other benefits of the LED headlight include uniform light pattern, a long lifetime and a scalable chip arrangement allowing for precise configuration to specific application requirements. Peterson Manufacturing, Grandview, Missouri, entered the automotive forward LED lights market with the introduction of a new, US-designed, tooled and manufactured 7-inch round aftermarket LED headlight featuring two Osram Ostar Headlamp Pro devices per headlamp (one for low beam, one for high beam). Peterson found these LED light sources to be much more efficient than halogen lights, drawing only 0.7-1.9 amps, and understands that they will last many times longer than a traditional sealed beam. A color temperature range of 5400 K to 6300 K closely simulates the natural daylight. The solid-state dual-volt design is compatible with all 12-volt and 24-volt vehicles. At the beginning of Peterson’s development process, Osram provided technical support and cooperated with Peterson on the development of a concept design, including optics choices and computer simulated thermal analyses. Osram has been a partner on this project from the beginning and, according to Peterson, has continued to be an excellent resource throughout the development process. 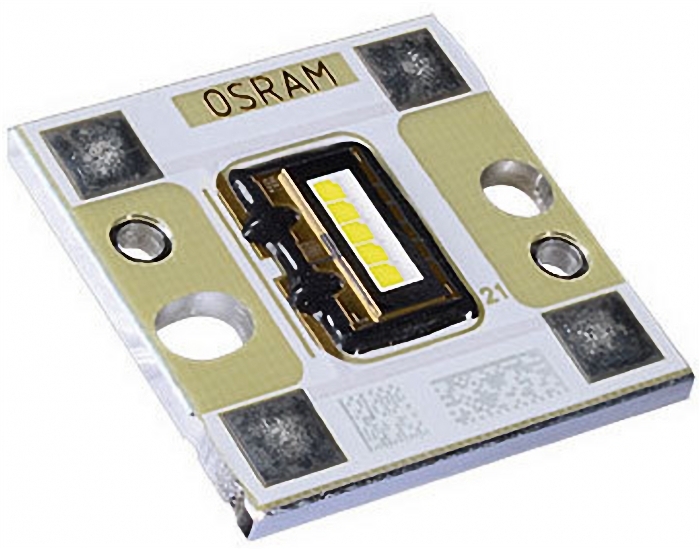 Mike Godwin, director of Visible LED NAFTA, said, "Osram Opto Semiconductors is pleased to support Peterson with enabling Osram Ostar Headlamp Pro products and technology that has been enhanced with our application engineering services. Peterson’s 7-inch round LED headlamp is an excellent example of joint development with the latest LED technology enhanced with US Innovative application engineering support."